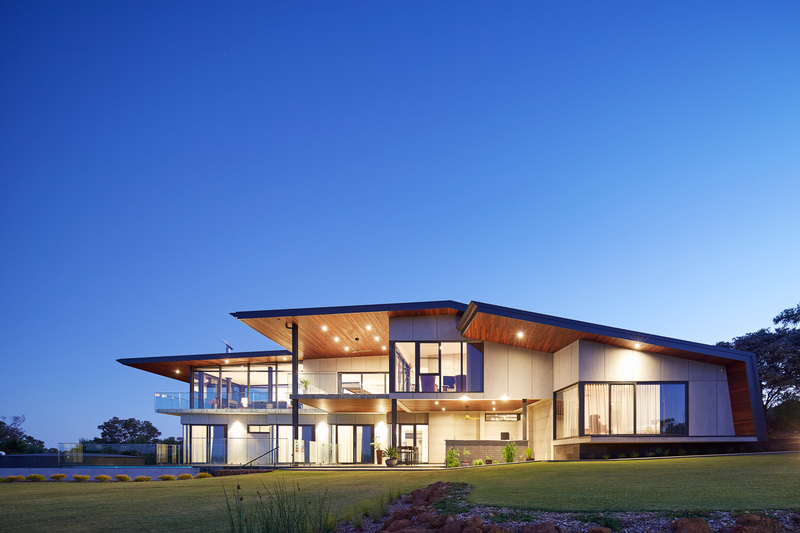 Eagle Bay 2 – Naked Architecture in collaboration with Fringe Architects/Tallwood Construction. 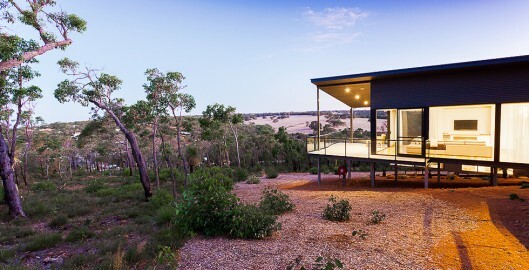 This house was designed as much a response to the site as a response to the brief. 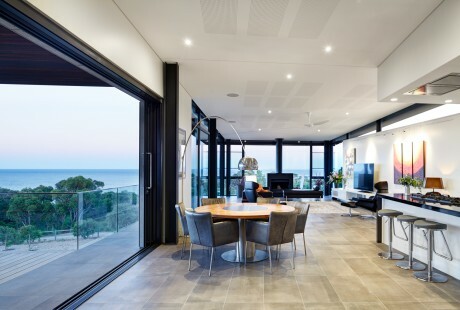 The elevated site enjoys spectacular views of Geographe Bay, requiring extensive but critically designed glazing. 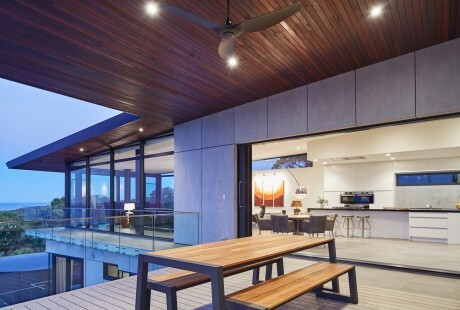 The home steps down the sloping site, with raking, folding, stepping roof forms that extend generously beyond east walls, creating shelter to the extensive glazing. Siteworks were minimised by stepping the lower level down the slope via a 1.2m change of level down to the Guest wing. Coinciding with the step down is the main stair up to the Living areas. Thermal coupling via slab-on-ground, double glazing with thermally broken frames selectively located, extensive roof overhangs to east and west, minimal west and south facing glazing, well insulated reverse brick veneer walls and thermally massive Stabilised Rammed Earth (SRE) internal walls combined to create a seven-star energy rating. 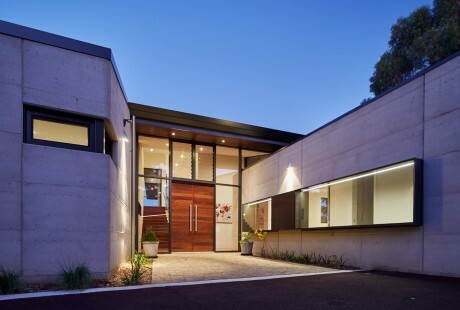 The entry is a relatively human scale, single storey wall heights comprising light, cool grey SRE walls and raking metallic ‘Cordite’ Colorbond steel clad walls. Long, low ‘picture’ windows with 600mm deep, flat plate aluminium reveals articulate the long SRE wall forming a flank to the entry. 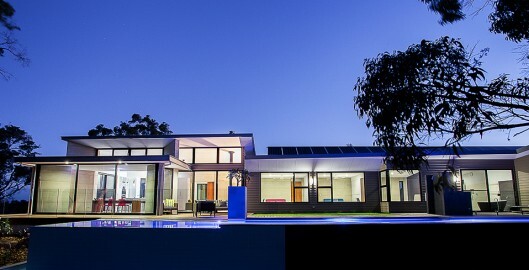 The house expands in height beyond the foyer, down half a storey to Guest-Wing or up a storey to main Living areas. The result is a series of overlapping levels and folding roof planes gently increasing from the human scaled entry to generous volumes and overhangs towards the rear of the house. A common theme in material selection is integral finishes. 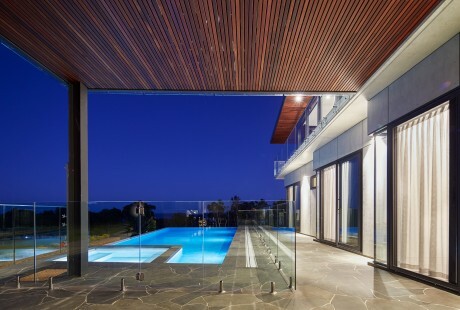 Stabilised Rammed Earth (SRE), face block, Colorbond steel, CSR Barestone cladding all have integral finishes, not requiring ongoing maintenance, except for the jarrah soffit lining and garage door, which have a clear anti-UV finish. 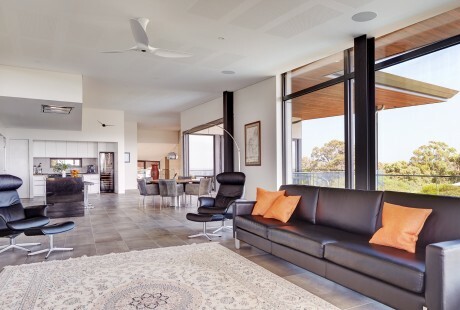 Completed in November 2016, Naked Architecture in collaboration with Fringe Architects and Tallwood Construction is ecstatic to see this Eagle Bay house’s clients move in! Like us they are delighted with the outcome. …the final result, for a very happy client. To view visit the gallery. This project is finally complete. You can see it here.